the quiet of the english countryside was shattered recently when an unusual formation mysteriously appeared. nearby villagers who are prone to panic did so. 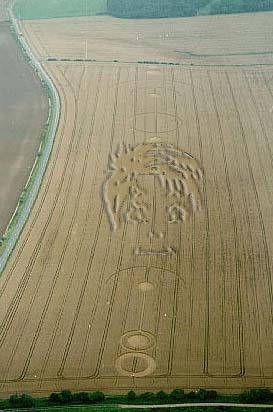 according to local authorities, who requested that their names be withheld so people don't think them daft, a crop circle was spotted that bears a striking resemblance to american satirist and songwriter camille west. "it's uncanny," the startled constable said after viewing the field for the first time. "it looks just like the graphic from camille west's web page." indeed, the pattern in the field of winter wheat, when subjected to scientific study, does match the aforementioned graphic representation of ms. west. the implications, according to dr. norbert huffington, associate director of implications for her majesty's government, are exciting. "this is proof positive that there is life out there and that they are surfing the web. plus, they like folk music. i wonder if they wear birkenstocks?" this page will be updated as further developments are reported.